183 p., 15 ill., 14,7 x 20,8 cm. With contributions by Jacqueline Amati Mehler, Hermann Beland, J. Chasseguet-Smirgel, Ernst Falzeder, Gerhard Fichtner, Ilse Grubrich-Simitis and Sigrid Weidlich. Evenly suspended attention and violence-free understanding are described as the conditions of psychoanalytic therapeutic and scientific success. They are gained against the unconscious violence of defence processes, understood as reactions to unbearable feelings (Freud) of critical intensity. Two clinical cases clarify the role of counter-transference-entanglement and the progress from tolerance of ›not-knowing‹ to understanding and interpretation. The dangers of collective unconscious violence (›scientific‹ formation of prejudices) and of collective projections of psychoanalytic groups onto society are explained by means of the interpretation of Günter Grass’ ballad Die schwarze Wolke. The author presents the psychotherapeutic treatment of a female patient, which was terminated after one hundred sessions. A childhood trauma had a major impact on the psychic structure of the patient. A special countertransference feeling of the therapist after the patient had shut the door after the last session triggered the account of the treatment. The analysis of the beginning, the process and the termination shows the permanent struggle between the libidinal cathexis and the destructive attacks on the object. The latent murderous quality of the treatment’s process became clear for the analyst after she had survived the separation from the patient. Sigmund Freud’s essay on Michelangelo’s Moses is a quasi-autobiographical text. In the years in which it was created, from 1912 to 1914, Freud was thoroughly obsessed with the sculpture. At the same time, these were the years in which the quarrel between Freud and C.G. Jung took place. Freud interprets Michelangelo’s portrayal projectively and holds that the artist presents Moses, in contradiction to the Biblical text, when seeing his people dancing around the Golden Calf, as not allowing himself to be carried away by his wrath and to shatter the tables of the law. This interpretation is false – Freud ignored telling details that refute his argument, especially the horns on Moses’ head. However, in interpreting the sculpture in this way in his personal crisis, he created for himself a personalised ego-ideal of self-control. In a more recent and more convincing art-historical interpretation Michelangelo is thought to show Moses at a later period of his vita after he had spoken with God and been told about the forthcoming end of his life. Looked at in this way the undiminished impact that the statue has on us can be seen to be rooted in the masterly representation of terror in the face of man’s fragility and mortality as well as of the ultimate taming of such terror. There are points of contact between the two interpretations. In the title of the paper, the author quotes and later expands on Gaddini’s term, with which he defines an area of the evolving psyche intimately linked to somatic and biological functioning. 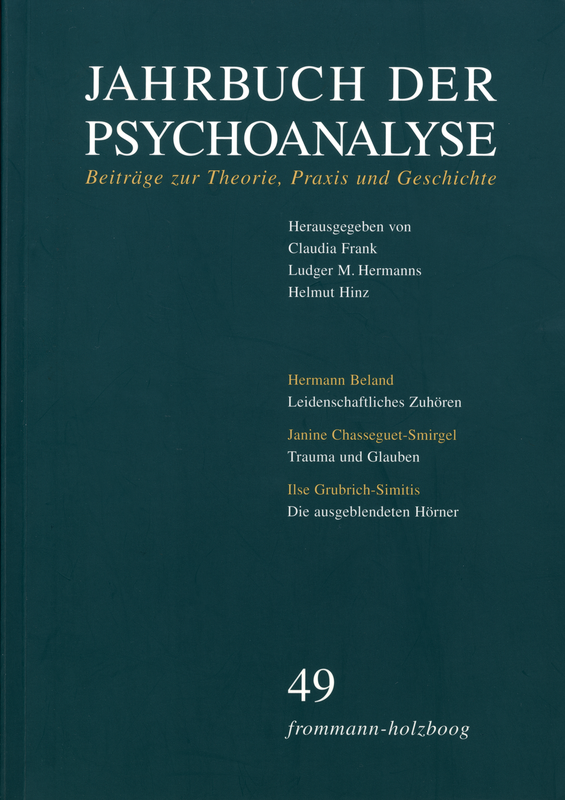 In the tradition of Loch’s thinking the author tries to link Freud’s terminology and current psychoanalytic concepts focusing on the use of the counter transference and having enlarged our understanding of the most primitive psychic structures. The paper discusses different theoretic contributions of authors others than Gaddini and Loch as well to support the thesis, that within the last decades the scope of psychonanalytic action has very well widenend beyond the frame of classical theory, but not necessarily beyond classical setting and method. The author is interested in the analysability of the mentioned area within a highly complex ego, which may overwhelm other, highly differentiated parts. She illustrates her theoretical introduction on the basis of two analyses, each conducted with five sessions weekly, one with a psychotic, the other one with a severely disturbed neurotic patient. The article deals with the beginnings of psychoanalysis as a psychotherapeutic method and as a profession. It covers the period from the 1890s until the founding of the first training institute, which is roughly divided into six phases: (1) The two first pupils of Freud’s. (2) Freud’s demonstration of his method before a few of his colleagues. (3) The founding of a private discussion group. (4) The rise of the Burghölzli in Zürich to the most important training and recruiting center. (6) The foundation of the Berlin Institute and the introduction of a training model still in practice today. In addition, the beginnings of supervision are dealt with.